We are a family run independent tile shop, offering a wide range of floor and wall tiles. Come and browse our selection of quality porcelain and ceramics, plus natural stone, terracotta , slate, glass and mosaics. If you need advice or help with any aspects of your project, please call or pop in and draw on our many years of experience. Samples are available to take home with no charge, and we will gladly come and measure for you and give you free quote with no obligation, either for supply only or a complete fitting service. We also stock all the usual tiling ancillaries, such as adhesive, grout, trim, sealers and cleaning and maintenance products. 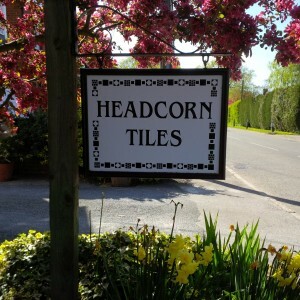 If you are looking for something just a little bit different, come and find us at Headcorn, we are open 10-4 Monday to Saturday, off road parking. You can find us here or please contact us or via phone on 01622 891103.